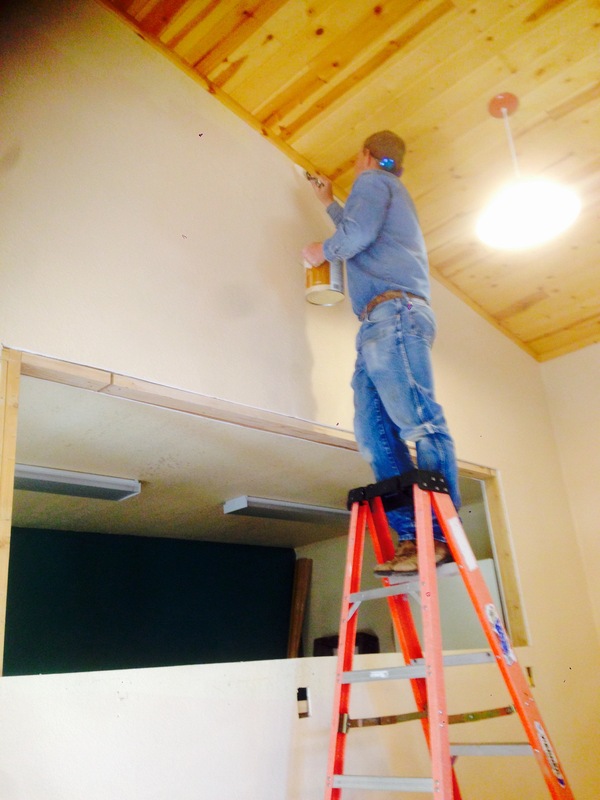 Paint and Trim Work… Now That is Romantic! We certainly know how to spend our Valentine weekend in a special way. 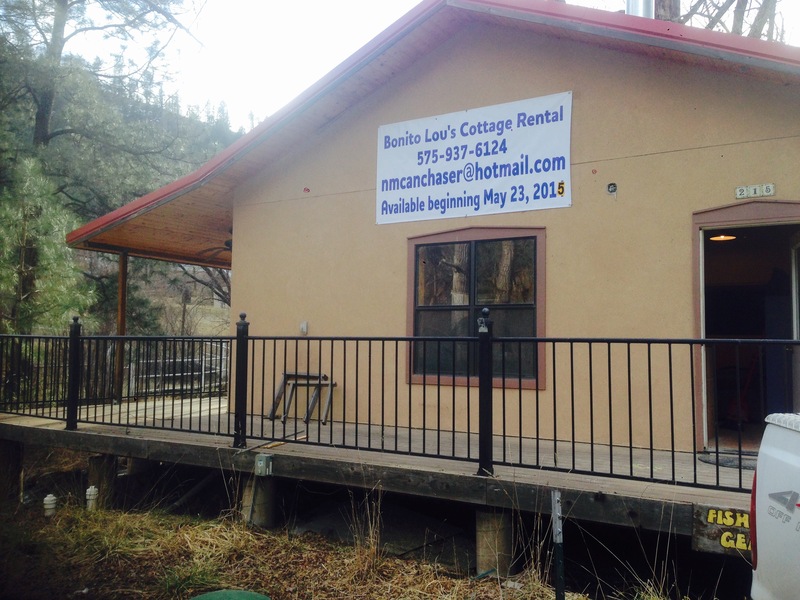 We’re in a time crunch to get Bonito Lou’s (my parent’s former bait and tackle store and cafe whose business ended when the Little Bear Fire destroyed Bonito Lake as we knew it two years ago) into a vacation rental that’s ready to rock by mid-May. For some reason when I look at a construction project I am really bad at estimating the time it will take. I thought we would be ready to rent it out last May. It only took a year longer than I expected. So far we’ve cut a big hole in the wall to open up the main living area to what will soon be the kitchen. The hole will contain the former store as a new bar top in the window to the kitchen. The kitchen has had a few hang-ups so far. 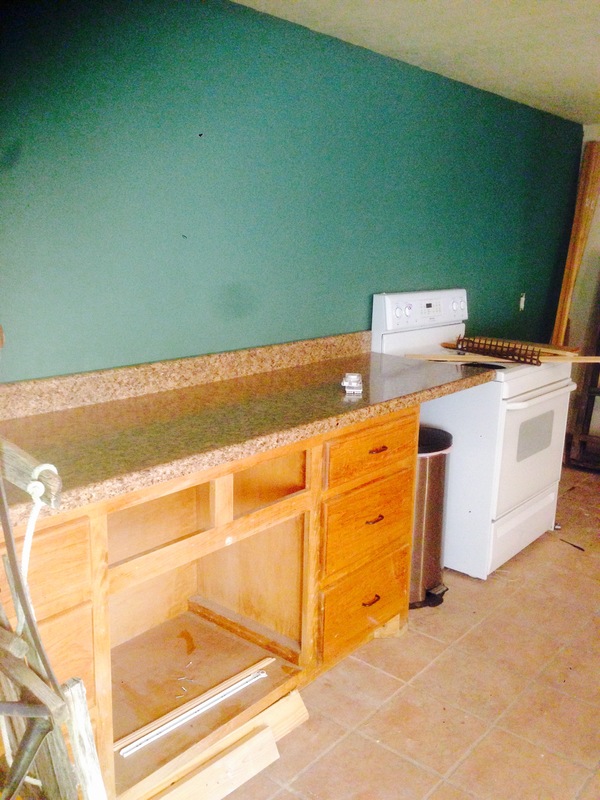 We figured out on our last work day that the counter top my mom purchased was too short. Got that exchanged yesterday. Today we got ready to set the sink and it’s way too big for the cabinet. Darn it, off to Lowes again tomorrow. In the main living area I got three walls painted today. Ronan helped me fill in all the holes from the former shelving with spackle so things could go a little faster. Still trying to decide on a color for the accent wall in the main living area…. rust or denim blue? We went with green in the kitchen and bathroom. Then there is the bathroom. Having a little trouble trimming out the shower stall since we added a shower after the room was built and finished instead of before like most houses. Apparently carpentry is not the electrician’s strong suit because he chewed up some trim with his saw, cussed a lot, then decided to be my painting assistant. Once we get the shower trimmed though, we are only waiting on the plumbers to come back and hook up the sink! Decorating is a bit more fun and exciting. Today we took down the historic Bonito Lou’s sign from the outside and we’re cleaning it up a bit to hang inside (we don’t want people disturbing our guests to buy fish bait or a hamburger)! We’ve also scored a great couch, table and chairs, bar stools and armoire so far. Oh and a 25″ long fish pillow. That’s probably the best score yet. We also went live on airbnb today too! Check it out https://www.airbnb.com/rooms/5358681 Hard deadline! We’re committed to being ready to rent! This post is all about love. Painting. Holes in the wall. Commitment. Electrician (the hubby) not so good at painting but at least he tried. I don’t like the last step on the ladder…. We took down the sign from the outside and are moving it in to be part of the decor! Notice the little update to the year on the banner.. yeah it read 2014. My timeline was a little off…. 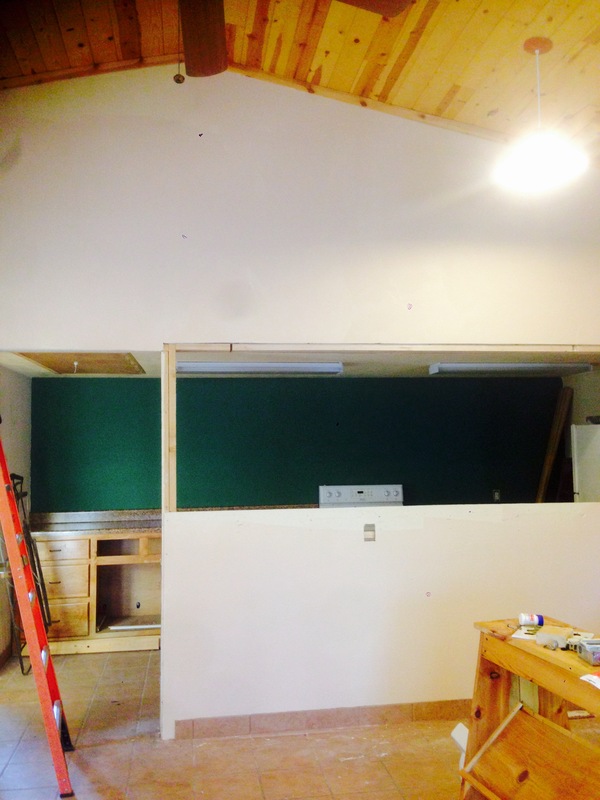 Kitchen in progress with the green accent wall! View of our hole in the wall! It’s gonna be cool when it’s all trimmed out and the bar is in! Gonna be awesome! It’s getting exciting! Breathing new life into a property is so exciting..Love the before and after pics, keep posting. .